As if India’s weakening external payments and budget situation aren’t enough, reports of trouble at a non-bank finance company, a housing company, and a couple of private sector banks come as a fresh blow for the Indian rupee (INR). Recent developments have regulators, including the central bank (RBI), on their toes. The negative news from the financial sector is keeping the USD/INR firmly on track to meet our 73.50 forecast for end-2018. A major infrastructure financier, Infrastructure Leasing & Financial Services Ltd., has been in the limelight since last week due to a serial default on its debt obligations. The company known previously for its solid credit standing- with major domestic and foreign banks and corporates as its shareholders- holds a large infrastructure portfolio. The problems started with cash on hand being drained amid delayed implementation and cost overruns on ongoing projects. It's now complicated by rising market interest rates. This has left the company with only $27 million against the $500 million required to meet debt obligations due over the next six months, according to Bloomberg. A downgrade of the company’s credit rating poses a hurdle for the rollover of maturing debt. Absent any bailouts by the government or shareholding companies, this could drag the company into further defaults. And it doesn’t stop there. The problem appears to be spreading to the broader infrastructure and financial sector. Financial stresses at a mortgage lender and two private sector banks have been making matters worse. The result is tighter liquidity conditions driving short-term rates higher and the INR towards more weakness (see figure). The financial problems of a major infrastructure company don't come without political implications for the current administration. This could put Prime Minister Modi’s infrastructure-boosting policies on the back burner, a setback to his bid for a second term at general elections in early 2019. 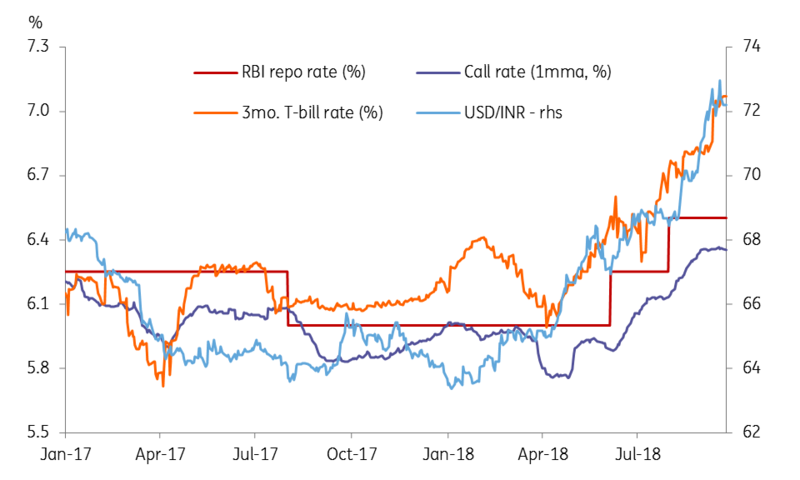 These troubles also complicate RBI policymaking ahead of the next bi-monthly meeting in early October when another policy interest rate hike is looming large. The rate hike will push market rates higher and squeeze liquidity conditions further, making things even worse for troubled players in the sector. Add to these woes, the crowding out of private investment likely as a result of government borrowing requirements, which authorities will unveil for the second half of FY2019 sometime this week. We believe the INR is in for continued losses ahead. We are sceptical that the RBI will raise rates by more than 25 basis points at the next meeting given that inflation is, at least for now, running below the 4% mid-point of the central bank’s target. This will be just enough to make up for the rate gap to be opened by the US Federal Reserve's 25 basis point hike expected later this week, nothing more. If so, then three Fed rate hikes this year will be merely matched by the RBI, without giving the INR any interest edge to gain against the USD. The RBI will have to do more, though that looks unlikely on the grounds of on-target inflation and stress in the financial sector. The situation leaves the bank with a policy dilemma. The spot USD/INR at 72.67, as of this writing, is just shy of our 72.80 forecast for the end of 3Q18. We maintain our view of the pair rising further to 73.50 by end of 2018.